Autographed baseballs are very popular due to several reasons. First, baseballs have a direct and obvious relation to their sport. They are also very cheap as far as official sports equipment is concerned. And they are small, so storage is basically a non-issue. Because of its size, there is a tendency to just put a ball on a shelf and forget about it. There, it gathers dust, becomes discolored and the autograph fades. That signed ball is also free to roll around and fall, risking further damage. I'm not sure about the rest of you, but if there is an unprotected baseball sitting around near me, there is a pretty good chance that I am picking it up and tossing it to myself. You've been warned. While a dedicated collector may amass hundreds of signed baseballs, it is a safe guess that the average person has a one or teo lying around in their basement or attic. Even if the signature has no real monetary value, preserving that memory with baseball display cases is a simple and relatively inexpensive process. 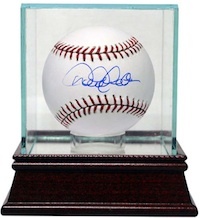 When it comes to purchasing signed baseball display cases, the first thing to decide is if you plan to display the balls individually or in a group. This should be obvious, but if the display does not feature something that encases the baseball, there will be little added protection. Most people will only need a few individual signed baseball displays, so we will get into that first. The best value option is the plastic square display case. The ball is protected inside a transparent cube that is formed with two pieces that snap together. Many collectors choose to store these in the boxes they come in with a label on the outside for further protection from light. If you plan to buy several of these at once, buying baseball display cases in bulk will normally feature a discount versus buying individually. The deluxe case is a nice option for a collector that has only a few autographs or several signatures that deserve special treatment. They all tend to be a little bigger than a basic case and usually feature a raised wood base. 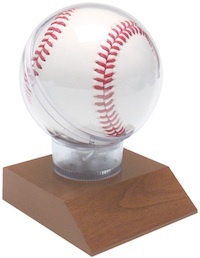 It is worthwhile to find a display case that features UV protection if you plan to display the ball in a bright environment. Prices will fluctuate widely based on the materials used and the ornateness of the display case. 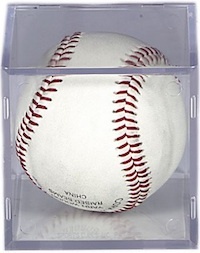 The fitted display case features a tighter fitting sphere protection that showcases the shape of the baseball. While these might be more pleasing to the eye, the ability to stack baseballs is removed and they rarely feature UV protection. Since they can be had for a few dollars, these are generally better for kids or balls where the memory is more valuable that the ball itself. This is where things get more complicated as there are virtually unlimited options when it comes to multi-baseball display cases. They can be made to hang on walls or sit on shelf. The cases can be designed to look like a base, a diamond, or a specific logo. Whatever your need, if you have the right budget, you can find it. Again, the quality of materials and any other added features will cause these to cases to vary wildly in price. Thanks Trey for the informative article! Personally, I am a fan of the fitted cases that are mounted on the rectangular wood plaques. These have a nice broad diagonally slanted surface that are ideal for affixing adhesive name plates. A superb, top-quality seller of these name plates is an eBay seller named customsportsnameplates. They do top quality work in creating name plates for just about any well known player past or present you can think of. I’ve purchased several for my display cases and plaques and the quality of the product really makes the memorabilia piece pop! Read your article om baseball display cases. I was wondering if you could answer a question for me? My son is only 13, but is slowly amassing a nice autographed baseball collection. He currently has them in single cases, but they are starting to take up a lot of space. I was looking at purchasing a hanging case for him. My question is this, a lot of the hanging cases have wooden shelves with holes cut out to rest the balls in. These shelves appear to be stained. I’m thinking that in time, that stain could create a mark on the ball. Should I look for acrylic shelves, or do you have any suggestions? Thanks so much. Carolyn � The potential for staining is certainly a valid concern. If it were my decision, I would probably go the acrylic route unless I could inspect the version with a wood shelf in-person. I have also seen versions that are deep enough to hold a baseball that is inside an individual cube. The specific one I saw recently held five rows of four baseballs. The end result does not look quite as nice, but it is essentially a double level of protection and makes handling of the balls less detrimental to their longevity. 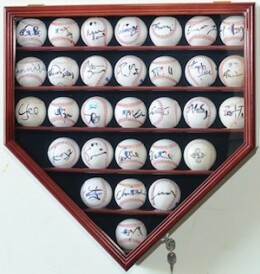 Can you please let me know how much a multi baseball display case that holds 15 balls costs? Thank you.